Everyone is panicking. It's snowing. The world is apparently ending. Snow!!!! You should have seen people at Wholefoods today. It was terrible. People fighting over the last pack of chicken. I figured if we're going to be snowed in for the rest of our lives like the news is saying, we'd better have something delicious. These are delicious. 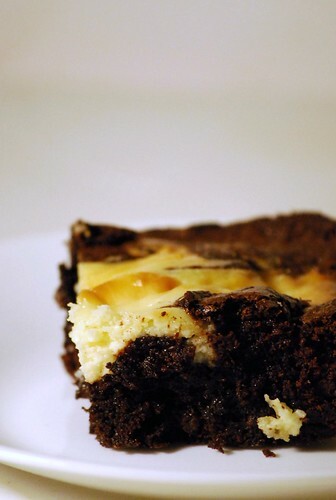 Fudgy brownies, tangy cream cheese, I could have eaten three. Or six. They're good for a snowy night. 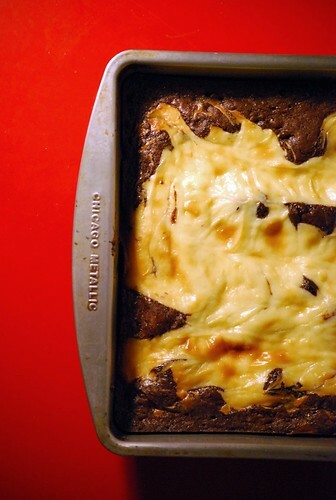 My favorite brownie recipe, plus a cream cheese topping. Preheat oven to 325. Lightly grease an 8x8 pan. Melt the chocolate in the microwave with the butter. Mix in the sugar, eggs and vanilla. Stir in rice flour and xanthan gum. Spread the batter in the pan. In a clean bowl, mash together the cream cheese, egg yolk, and sugar. Keep stirring until smooth, then plop in three thick lines across the batter. Swirl around with a knife. Bake for about 45 minutes, until the center isn't jiggley. Cool completely before cutting. Can I be snowed in with you? These look amazing. I've made it last week. This is the best dessert one can have!! Hmmm... May have to give these a go with soy cream cheese (I'm also casein intolerant.) Looks too good to share! OMG these look delicious!! I'm making these today! Thank you so much!